If you walked past this house in the Brisbane suburb of Kenmore, you’d be hard pressed to tell that the carport was new. 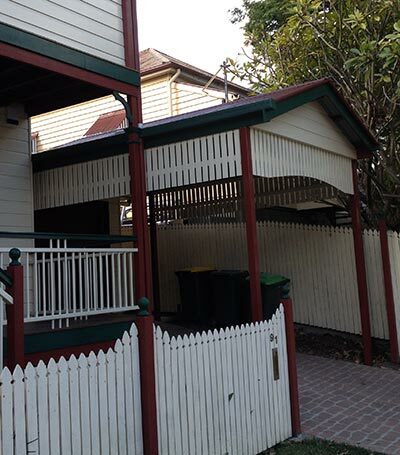 Apart from the fresh paintwork, the Brisbane single carport looks exactly like the house it adjoins. Which is just as well because that exactly what the homeowners wanted! When the homeowners contacted Mr Carports one of their key wants was a Brisbane single carport that perfectly matched the existing house. On the surface, this may seem simple. After all, the inspiration is sitting right in front of you in the form of the house. However, in practice, matching all the materials and colours from the house isn’t simple. The timber slats, which match the white picket fence, perform another important role. With the driveway sloping sharply from back to front there was a risk the carport would have appeared top-heavy and on stilts. The timber slats alleviate this and add to the overall style of the carport. The result is a Brisbane single carport that is as stylish as it is practical. As well as adding practicality for the homeowners now, it’s sure to add value in the future if ever the homeowners decide to sell. For more information on building a stylish carport for your Brisbane home, see our Brisbane branch page. To organise a free design and quote for your Brisbane carport, phone Mr Carports on 1800 557 782 or email info@mrcarports.com.au.